When it comes to a weeknight meal, I’m usually looking for something fast, tasty, light and inexpensive. This can be tricky. Add in a few little kids and it gets even trickier. 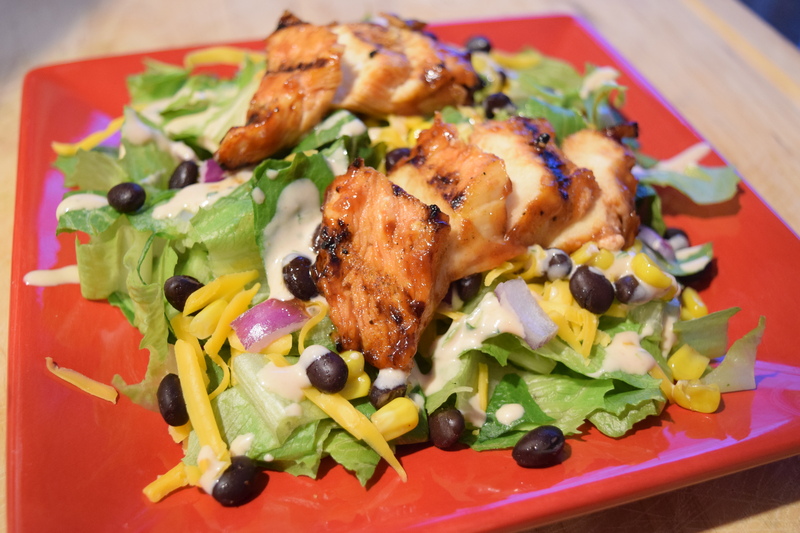 This chicken salad is a fantastic weeknight meal that your family will love. It won’t break the bank and it’s ready in a flash! And did I mention it’s delicious?! This salad is bright, fresh and packed with flavor. I am committed when it comes to grilling. Yes, I am the crazy person out there grilling in the snow. But there’s just something about that char-grilled smoky flavor that absolutely sends this chicken salad over the top. If diehard grilling is not your thing, you can also bake the chicken in a greased 9×13 for twenty minutes at 375 F or until cooked through. This salad is too good to save for summer! Place the chicken strips in a medium glass bowl. Pour one cup of barbecue sauce over the chicken. Stir until the chicken is fully coated. Then cover and marinate in the refrigerator for 2 to 3 hours. Whisk all of the dressing ingredients together and refrigerate until needed. You can add more barbecue sauce if you prefer a stronger barbecue flavor. Thaw the corn and mix together with the drained and rinsed beans. Sprinkle chili powder over the corn and beans and mix. When you have all the elements of the salad prepared, preheat the grill on high heat. Grill the chicken until cooked through – about ten minutes. Slice strips diagonally. Toss the lettuce, corn and beans, onions and cheese. 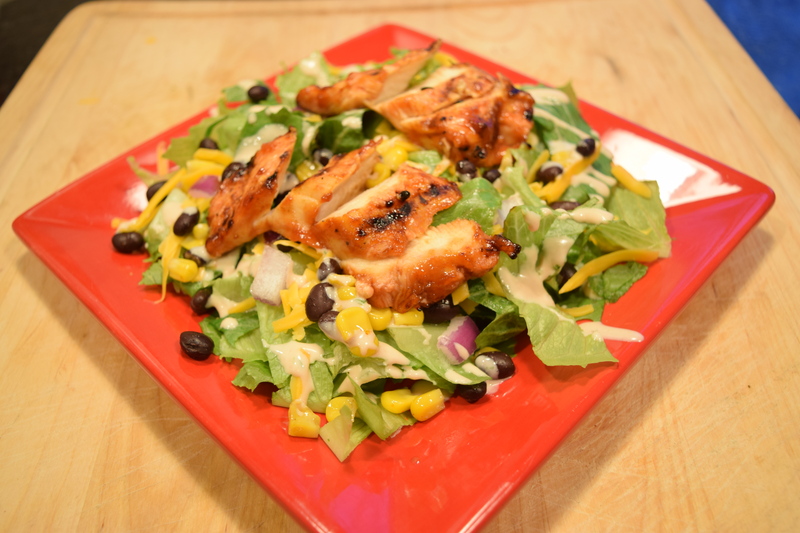 Place the grilled chicken on top and drizzle lightly with the dressing. Enjoy! Tags: Barbecue Chicken, Barbecue Chicken Salad, BBQ Chicken, BBQ Chicken Salad, Creamy Cilantro Dressing. Bookmark the permalink. I have everything but the mayonnaise 😦 I was so going to make this for dinner. It looks seriously awesome !!! The salad sounds and looks delicious , can’t wait to prepare it ! This looks and sounds SO good! It may be the perfect new lunch for me to add to my rotation! I get so excited when someone tries one my recipes!! Glad you liked it!